An unforgettable glacier experience in Iceland where you go snowmobiling on Langjökull glacier and explore a magnificent man-made ice cave. At Jaki base camp at the foot of Langjökull Glacier you suit up with snowmobile gear before heading off onto the vast snowfield. Racing across surreal landscapes you make your way to Into the Glacier. Inside the man-made ice cave enjoy a guided tour 200 meters (656 ft) into the ice tunnel at 40 meters (131 ft) under the ice-cap. 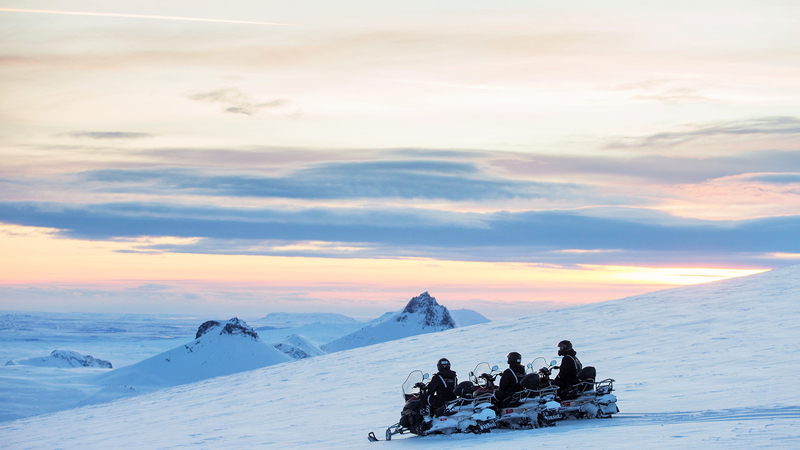 Return from the ice cave to Jaki Base Camp on your snowmobile and savor your final glance at the magnificent Icelandic highlands. Into the Glacier by snowmobile is truly an unforgettable experience and an unique opportunity to discover an endangered natural phenomena. See the glacier both from above and below on this one-of-a-kind adventure you won’t find anyplace else.